The quiet village of Westhampton Beach on Long Island had been looking toward this past weekend with a wary eye. The Eastern Long Island chapter of Black Lives Matter was poised to stage a march on Sunday morning in front of Village Hall and, because it was rumored that the KKK was planning a counter-protest, tensions were high. The rumor was not without merit. Late last month, an incident was reported by residents and police involving KKK fliers dropped onto the lawns of homeowners in Southampton Town, which includes Westhampton Beach and the neighboring hamlet of Quogue (a neighboring community, Hampton Bays, reported two similar incidents last year). The fliers singled out the Black Lives Matter movement for criticism and invited people to join the KKK. The rally in Westhampton Beach was just one of a series of Black Lives Matter rallies on Long Island’s east end, which is home to the “Hamptons” on the region’s south fork, as well as the bucolic farms and vineyards fronting the Long Island Sound to the north. Several hundred people showed up to each of the chapter’s previous events, which took place in Riverhead and Easthampton, and plans are underway for another. 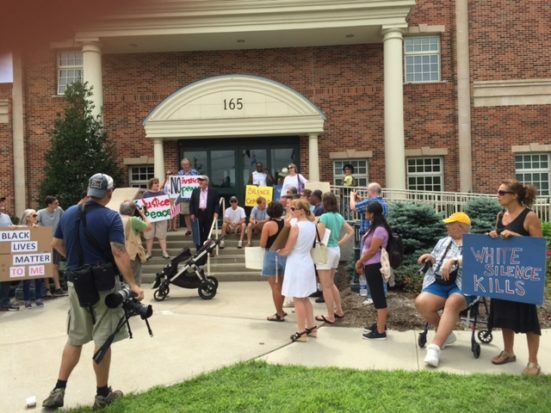 According to a Westhampton Beach official, this weekend’s march was preceded by phone calls to Village Hall from residents wanting to know the motivations of the organizers and questioning the village’s plans for managing any counter-protests that might arise. The day of the march, the village had its full complement of police on hand, and neighboring and countywide law enforcement agencies were put on stand-by. At the rally, local organizers mingled with two hundred or so people. Some were there to observe and others actively participated, holding signs, singing songs and posing for photographs before chanting and peacefully marching past shops and restaurants up and down the village’s main thoroughfare. We’re trying to show that everybody matters. We came out here to show that the KKK is not gonna deter us from spreading our message, they’re not gonna scare us, especially in our own towns. You know, I’m from the Hamptons my whole life, I’m not going anywhere, people are out here and we’re not going to stand for this in 2016. With an engaging approach, he assured those assembled that the organizers came in peace and, in what appeared to be a deliberately inclusive manner, led chants of “All lives matter” and “Blue lives matter” in addition to other messages typically associated with the movement. Based on 2000 and 2010 census data, Long Island continues to be one of the most racially segregated regions in the country with segregation between blacks and whites remaining extremely high and segregation between Latinos, Asians and whites increasing. Long Island is more segregated by race than by income. Black and Latino families, regardless of their income, experience high levels of racial segregation. For example, on average a black household that earns more than $75,000 resides in a neighborhood with a similar level of exposure to whites as a black household that earns less than $40,000. Racial segregation, combined with concentrated poverty in majority black and Latino neighborhoods, perpetuates a public school system that is separate and unequal. For example, 91% of all students in high need districts are black or Latino. Few of Long Island’s black and Latino students have access to the highest-performing schools on Long Island. Based on graduation rates, 3% of black students, 5% of Latino students, 28% of white students and 30% of Asian students on Long Island have access to the highest-performing school districts. Diversity is not a benefit to the region if residents continue to live in segregated neighborhoods and students continue to attend racially and economically segregated schools. The report noted particularly that since the Latino population is the fastest-growing racial/ethnic group on Long Island, their increased isolation, along with the continuing very high black to white segregation levels, is cause for great concern. As Nonprofit Quarterly reported here last spring, tensions between white and Latinos were heightened in another Long Island village this year when the Suffolk County Republican Committee planned a fundraiser with Donald Trump in Patchogue, New York, steps away from the site where in 2008 an Ecuadorean immigrant was fatally stabbed by a gang of seven teenagers making sport of violence against the Latino community. Peaceful protests were organized in response to the fundraiser, and Patchogue’s mayor, Paul Pontieri, played a leadership role in defusing the situation, as he had eight years earlier after the fatal incident when he worked tirelessly to build trust between the community and the police and made it clear that he and his administration would not tolerate divisiveness. The Black Lives Matter rallies held this summer on Long Island have been highly local affairs, organized by citizens who have grown up in the community and who are using the platform to express long-held feelings of isolation and frustration with what they perceive as an unfair and biased system. Judging from the number of white residents who have turned out to listen and march in solidarity with them, there would appear to be sufficient interest in dialogue. Long Island’s east end mayors would be smart to follow the example of forward-thinking mayors like Paul Pontieri and issue a collective statement pledging to keep the channels of communication open to all citizens, promoting inclusivity and declaring, unequivocally, zero tolerance for acts of racial hatred and divisiveness in all of its guises.